The US may be considering the possibility of applying the Nunn-Lugar program to North Korea’s denuclearization in the run up to the US-North Korea summit. US President Donald Trump and North Korean leader Kim Jong-un are set to meet in Singapore on June 12, the agenda of which is being negotiated by working-level officials. The Nunn-Lugar program refers to the Cooperative Threat Reduction program the US implemented in handling weapons of mass destruction, including nuclear weapons, of the former Soviet Union. The program, also known as the Nunn-Lugar Act, was written by former senators Sam Nunn and Richard Lugar in the early 1990s. Through the program, the US provided large funding and materials to dismantle weapons of mass destruction produced under the Soviet Union. The US also purchased large amounts of weapons grade nuclear materials reprocessed for power generation. 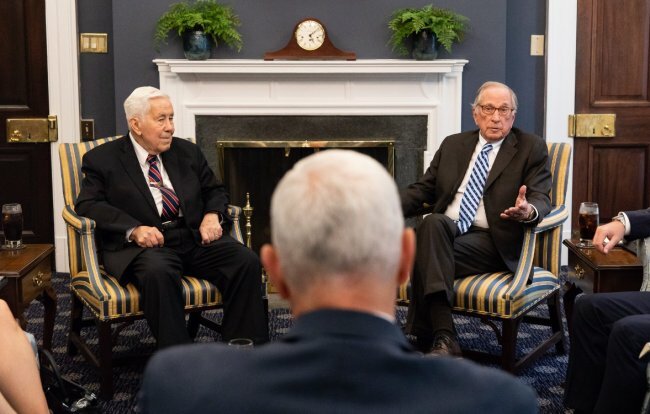 On Wednesday, US Vice President Mike Pence met with Nunn and Lugar. Following the meeting, Pence wrote on his Twitter account that he and Trump are “grateful for their counsel on denuclearization prior to the US-North Korea summit in Singapore,” hinting that the model is being looked at by the Trump administration. According to US officials, Trump has been dedicating much of his time to gathering information about North Korea, and discussing related issues with his top advisors. On Monday, White House Press Secretary Sarah Sanders told the media that Trump receives daily briefings from his national security team. On Wednesday, presidential counselor Kellyanne Conway told reporters that Trump’s preparations for the summit were “intense” and that he was reviewing documents and receiving briefings from officials. While details of Trump’s preparations remain undisclosed, the US president is said to be already considering plans for a follow-up summit with Kim. According to Bloomberg, Trump is toying with the idea of inviting Kim to his Mar-a-Lago resort in Florida for a second meeting, depending on the results of the June 12 summit. In a related development, CNN reported that the mention of the Libya model of denuclearization by US National Security Advisor John Bolton may have been aimed at derailing the US-North Korea summit. According to a CNN report citing US government sources, Bolton suggested the Libya model knowing that North Korea would object as he considered a US-North Korea summit to go against US interests. Bolton’s mention of the Libya model was met by vehement criticism from Pyongyang, which then prompted Trump to call off the summit on May 24.